We bring to you the world's first CHR( Cell history recorder), an instrument which would take away the need for a cell biologist to devote time towards laboriously taking images under a bright-field or Fluorescence based Microscope, for extended periods of time, but rather give you the possibility to constantly monitor your cell lines through-out the incubation period without any user interference. And, all this, while your samples are still inside a standard laboratory CO2 Incubator! 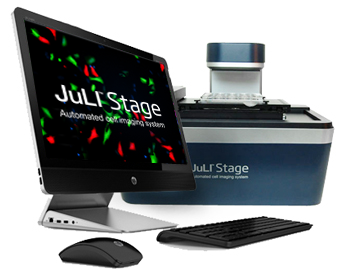 "Live Cell imaging from inside your incubator"
JuLI™ Stage is a fully-automated and digital fluorescence imaging analyzer that directly acquires cell image from various cell culture dishes in a cell-culture incubator. This also enables users to support the quantified cell confluence results with low variation and the growth curve using image based analysis for bright field.